Green leaves of Poison Ivy spreading high on the far side of the River. A very typical Poison Ivy plant really looking like a bush. Immature fruit can be seen on close inspection (a drupe of small berries - lower right). The young leaves are reddish and look oily and shiny and probably contain more of the toxic compounds. All parts are poisonous and should not be touched. 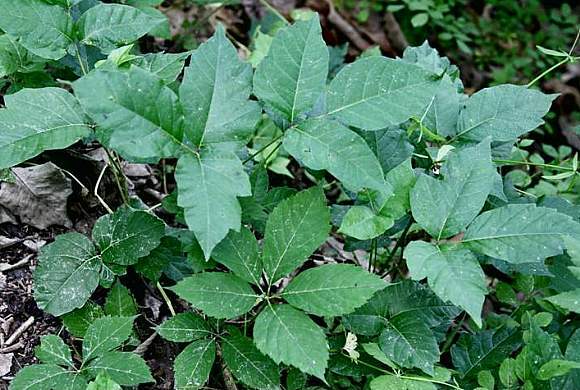 Poison Ivy has three leaflets but often grows with Virginia-Creeper, the plant in the photograph with palmate (five) leaflets. Poison Ivy as it starts to climb a tree. Leaves in triplets, with few and irregular teeth. 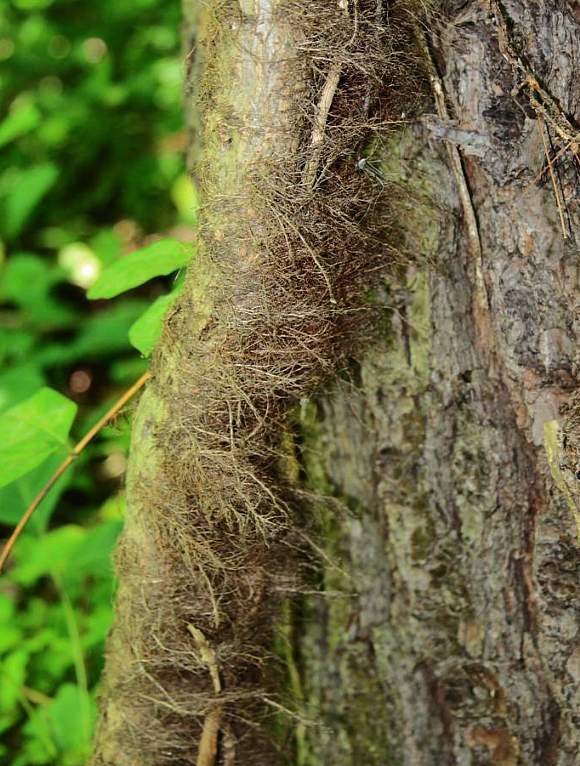 A vine of Poison Ivy climbs a tree, it clings to the surface of the tree with aerial roots which look like reddish hairs. This is an old stem and therefore the roots are easily seen but on young growth a closer look is necessary. They are best seen on bricks or walls. On tree bark they are much harder to see but they are there. Even the vines and hairs are dangerous to touch. 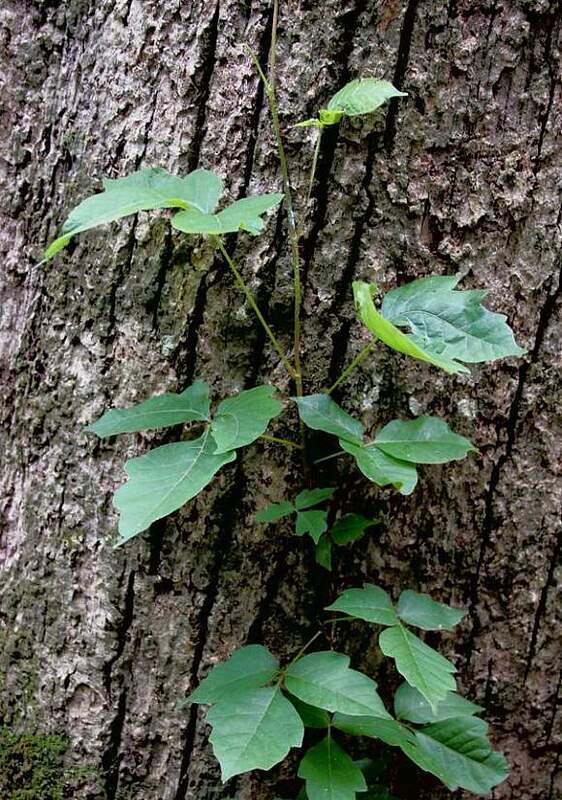 Virginia-Creeper, on the other hand, does not attach to a tree in this way but rather has tentacles with structures that resemble small suction cups. A drupe of (exceedingly poisonous) berries. They are green at first ripening to red. Easily mis-identified (in America, it seems) as : Raspberry! (you can even find photos of Rasperry plants and fruits on Google purporting to be Poison Ivy! ), but the leaves of Raspberry are finely toothed and the fruit is compound and large in comparison to the small spherical berries of Poison Ivy and the stems have sharp thorns. Some similarities to other climbing plants : Virginia-Creeper (Parthenocissus quinquefolia) but that has palmate leaves and to Virgin's-Bower (Clematis virginiana) but the flowers are much larger and white. No relation to : Ivy [a plant with similar name]. The above photographs were taken by Mr William Greenawalt at considerable risk to himself at the bequest of your Author, who is eternally grateful. It is best to keep as far away from this plant as is possible for even the pollen is toxic. The sub-captions to the photos were also supplied by William Greenawalt. Poison Ivy is not a true Ivy (Hedera helix) but is a climber like is Ivy. Despite the scientific name Toxicodendron it is not a tree either, but does belong to some trees of the same genus (Toxicodendron) which are themselves also highly allergenic and filled with extremely irritant sap (Urushiols). All parts are dangerous to touch even tiny hairs on the stalks or leaves. It can take three forms: as a short shrub, up to 1.2m in height, as a low spreading ground-cover plant and as a climber. It is not native to the UK and you are extremely unlikely to ever find it in the UK, although it is possible someone may (perhaps unwisely and inadvisably) be growing it as a specimen in some specialist garden somewhere. Kew maybe? They have a lot to answer for, with all the plants they have imported over the years that are now growing wild and rampant all over the UK. If they had to supply the trillions of pounds it might require (and the manpower) to eradicate Himalayan Balsam from the UK they might think twice before importing exotic plants from all corners of the World. The flowers of Poison Ivy are dioecious (male and female flowers on separate plants) and occur in small bunches having five turned-back yellowish-green petals and five protruding stamens with yellow-pollened anthers. 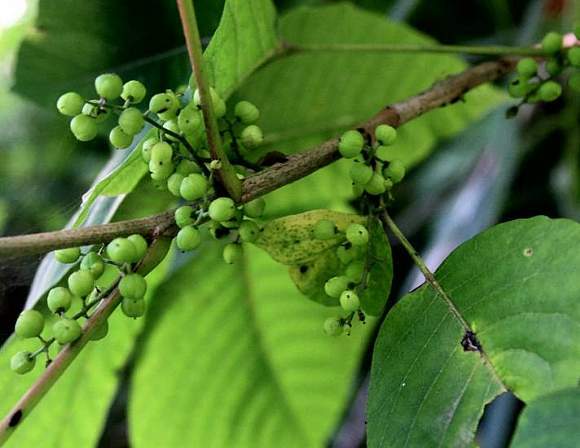 The berries (which obviously only occur on the female plants) are creamy green. Any hairs on the stalks or leaves are also dangerous to touch. It spreads mainly by suckering. The peel of Mangoes (which are also not native to the UK) contains urushiol oils and these may also cause severe irritation. URUSHIOIDS Ivy is not to be confused with: Poison Ivy (previously called Rhus toxicodendron but now called Toxicodendron radicans). The Americans call our Ivy English Ivy to distinguish it from their Poison Ivy , which is not an Ivy at all, but a highly toxic Rhus Tree or Toxicodendron, as are Japanese Lac Trees (Toxicodendron vernicifluum) and are possibly the most dangerous species of plants known. Although (English) Ivy is poisonous, its poison is incomparable to that of Poison Ivy. The smoke from some species of burning Toxicodendron Trees easily has the potential to kill or seriously harm anyone in the neighbourhood. Just brushing against a branch or leaf can inflict a dangerous allergic and painful rash or wheal that is extremely reluctant to heal. Most people are susceptible, only a few aren't. Luckily, Poison Ivy does not grow naturally in Britain, but can be planted, as can Japanese Lac. 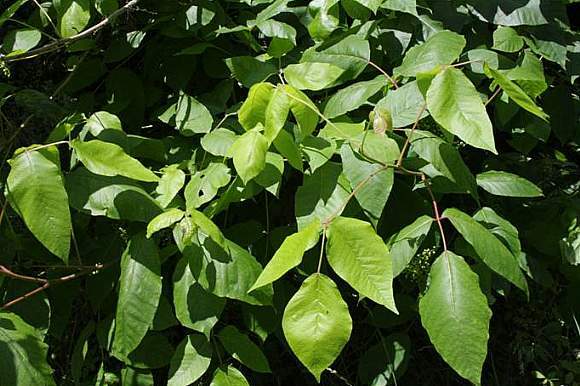 Poison Sumach (Toxicodendron vernix and Poison Oak (Toxicodendron diversilobum) are other non-native trees that possess much the same poisonous substances as Poison Ivy to a greater or lesser extent. It should be pointed out that some common garden Sumach or Rhus trees in Britain can also be very harmful (and the bark should not be touched by human flesh, let alone the sap! ), but they are not quite in the same league as Poison Ivy or Japanese Lac . It is said that touching the leaves is safe provided that they are not damaged in any way - when the poisonous oils can then leak out. A pin-head sized drop of urushiols is sufficient to cause irritation in up to 500 individuals. If it is washed off immediately then the person will usually be alright, but if a few minutes have elapsed then sufficient microquantities of the oil will have been absorbed through the skin and washing then becomes ineffective (apart from to remove that which has not yet been absorbed). Plants which have been damaged a while, where the oleoresins have had time to oxidise and polymerise to a black lacquer (given the right conditions of temperature and humidity) then they too should be safe (but probably unwise!) to touch. 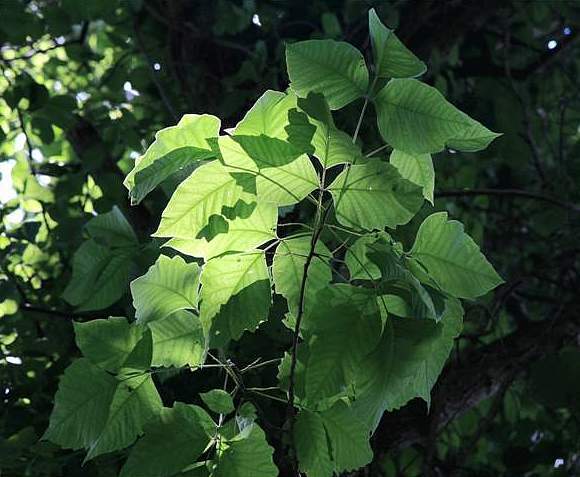 It should be noted that not everyone is affected by Poison Ivy, which can be due to them being relatively insensitive to urushiol s and laccol s, or be due to the varying amounts present in the plant at any one time. As with allergies, you may not get any reaction the first time you contact these compounds, but the second time could well generate a reaction which will only intensify significantly with subsequent encounters. Japanese Lac trees are famous for their ability to produce Japan (aka Black Japan), a lacquer used to give metallic bowls a shiny black coating in a process known as Black Japanning. The coating is due entirely to the polymerization of a whole profusion of differing and highly dangerous Urushiols and Laccols (collectively known as Urushioids ) present in the sap of the Japanese Lac Tree Toxicodendron vernicifluum) (formerly Rhus vernicifera). Once polymerized, the lacquer is quite safe and non-toxic. The polymerization of the Urushiols and Laccols applied to the metallic object is said to be performed by the application of a copper-containing enzyme called laccase. The Urushoids shown above are based on Catechol ( 3-alkyl pyrocatechol ) with an added long carbon side-chain, R, on the meta position. In the case of Urushoids, the side-chain is 15 carbon atoms long, and in the case of Laccols it is 17 carbon atoms long. Both can have double bonds, and these are more prevalent at carbon-positions 8, 11 and 14, but can be at other positions. Both Urushiol (I) and Laccol (I) have no double bonds. There are two cis/trans isomers of Urushiol (III), whereas Laccol (III) is only present in one form. Note that there is no naturally occurring Laccol (IV). Just a small selection of naturally occurring Urushiols and Laccols are presented here, those most likely to be present in Toxicodendron Trees to a greater extent. 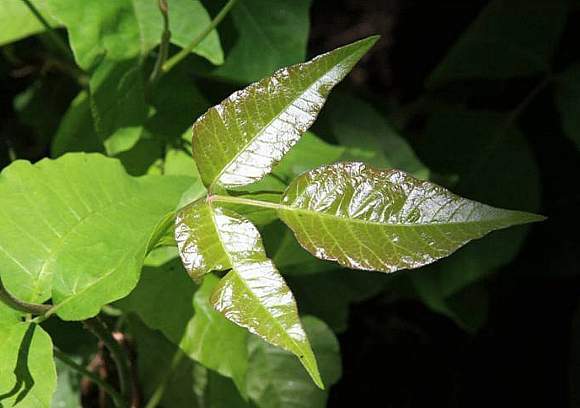 The actual extent for each particular Toxicodendron species varies: Urushiol (III) and Laccol (III) are the urushoids with the highest concentration in Poison Ivy. The compounds with the longer side chains tend to be the most potent. The 15 and 17 carbon atom chains in Urushiols and Laccols respectively, are thought to be derived from Palmitic Acid (with 16 carbon atoms) and Stearic Acid (with 18 carbon atoms) respectively. 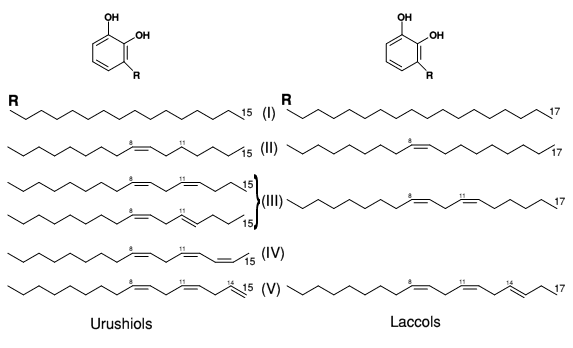 Continuing this line of argument, it occurs to your author that Laccols (II) could be derived from Oleic Acid, and Laccols (III) from Linoleic Acid. The toxic compounds present in Toxicodendron Trees are Urushiols and Laccols , of which there are a whole series of each, and they differ only in the number and positioning of their double bonds. Laccols and Urushiols themselves differ from each other only in the length of their hydrocarbon side-chains - 15 carbon atoms for urushiols and 17 for laccols. Urushiols and Laccols are not confined to just Toxicodendron Trees, but to other non-native plants too, including Ginko, Anacardiaceae (cashew nuts, the leaves and the skin of the Mango fruit, etc), Melanorrhoeas and Chloraphora species. Usushiols and Laccols will also oxidise in the air to quinone-form of the molecules. They will do similarly when on human skin where the quinine-form of the molecules will then react with proteins and skin cells. These changes in the cells fool the immune system of humans into thinking there is an invader and T-cells are mobilised to initiate white blood cells to attack everything in the vicinity, resulting in tissue damage, severe blisters and the appearance of a rash. It is highly likely that the resemblance of Urushiols and Laccols to fatty acids and oils is the reason why these compounds are so poisonous; they can infiltrate mammalian tissue masquerading as oils and, once there, do their worst. Zirconium Carbonate, which combines with urushiols, used to be used in lotion form as an antidote to counteract the symptoms of poisoning by Poison Ivy, but its use was discontinued in the 1960's after some reports of bad reactions to the compound. It has been found that a preparation made from Jewelweed (Balsams such as Orange Balsam (Impatiens capensis) and Yellow Balsam (Impatiens pallida) - the latter not being native to the UK) can be quite effective in treating rashes and blisters resulting from contact with Urushiols (which includes Poison Ivy). The Balsams contain Linolenic Acid , another fatty acid, which may have some bearing on this ability. 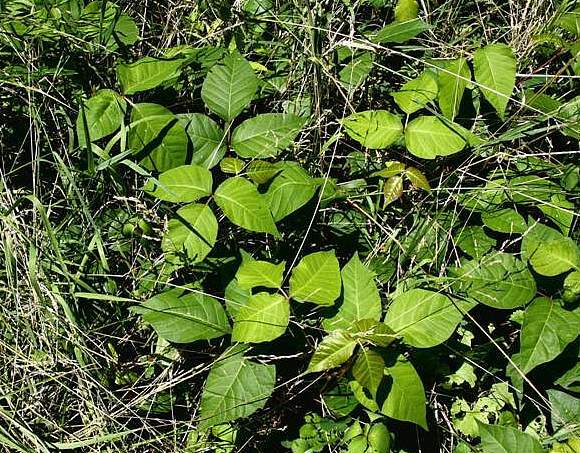 As a defence mechanism (against being eaten by mammals) that employed by Poison Ivy is very successful. It even deters anyone hacking it down or burning it, for the toxins are spread in the smoke too. 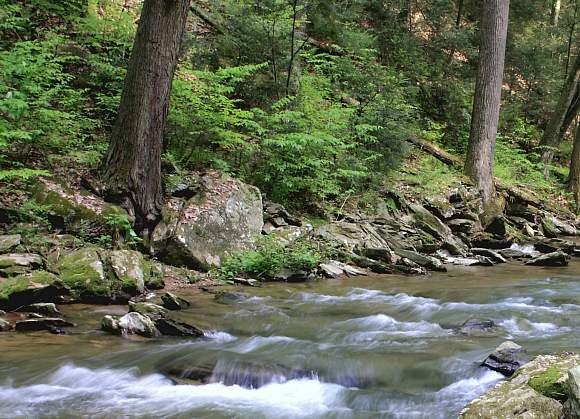 Thus unchecked, it runs rampant in many northern parts of the USA on the edges of forests and other partially shady places. It is also found in parts of Asia and China. There are two other related similarly toxic trees which occur in the New World and the Pacific Rim, namely Poison Oak (Toxicodendron diversilobum) and Poison Sumac (Toxicodendron vernix), neither of which thankfully grow in the UK, but that does not mean other Sumac trees which do are harmless, they are not! Although Poison Ivy luckily does not occur naturally in Britain, it is nevertheless very interesting, so I have put this page into the Wild Flower Finder.